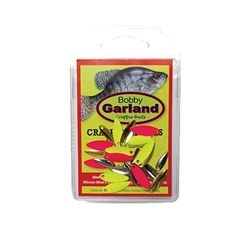 Create flash and add life to any artificial crappie bait with these tiny attractor blades from Bobby Garland called Slab Ticklers. Simply thread your line through the blade's hole before tying your jighead. The blade will flash and flutter freely in strike-enticing action. Blade sizes are 0 and 1, with 3 each of the 4 colors in the assortment: chartreuse, pink, nickel and 24k gold plated.